If like me you choose sometimes to be a man in the shed, then you NEED a sign. Initially I made one from an old piece of plywood, a chisel and some paint. You just need to come up with some words that suit what you want your shed to be and this can be as simple as “Abandon Hope All Ye Who Enter Here, ” or something more sophisticated like “Illegitimi Non Carborundum.” I am not going to translate that but feel free to look it up. 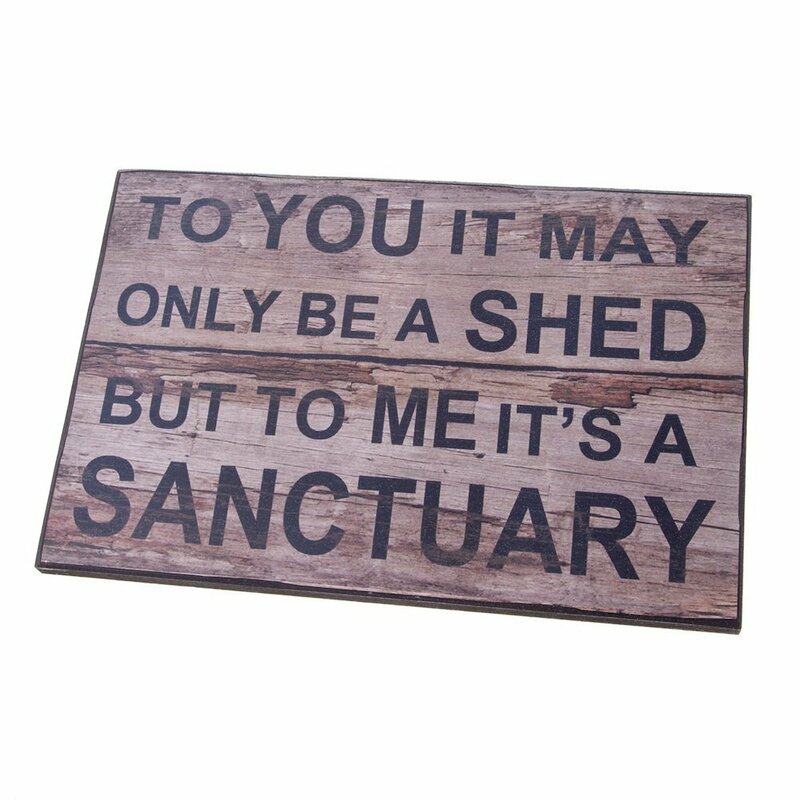 You get my point though – having a sign in your shed is a statement of the type of person who owns the shed, and also indicates the type of people who are welcome into your shed. 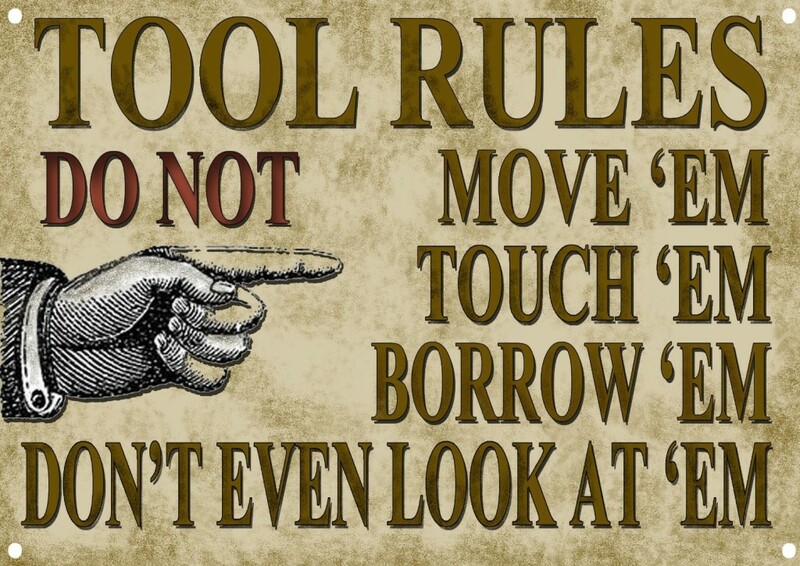 If they don’t like your sign, then of course they should not be there anyway – time to get shot of them!!! I have a couple of signs that I have also picked up at auctions. One is an old advert for oil which was in rough shape so I bought if for £2 and then fixed it up a bit and now it looks great. All I had to do was get rid of the rust and add some paint and varnish, and Bob was your Uncle. There are plenty of old signs knocking about if you just keep your eyes open. Things like old road signs can look really cool, and if you have “borrowed” the odd traffic cone, then you know what I mean. If you want you can also buy signs and just nail them up somewhere. I had a look around for a few and saw one over at Amazon that I like. That kind of sums it up pretty well and costs just under £10. It has that weathered background look to it and then it is written in black. People who read something like this and smile, well with a knowing smile, should always be welcome in your shed at any time. You can check it out over at Amazon by clicking here. 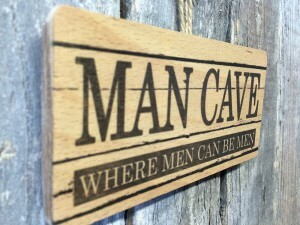 If you are on the edge of deciding whether you are the man in the shed or the “Man Cave” guy, then maybe the sign can help you decide. 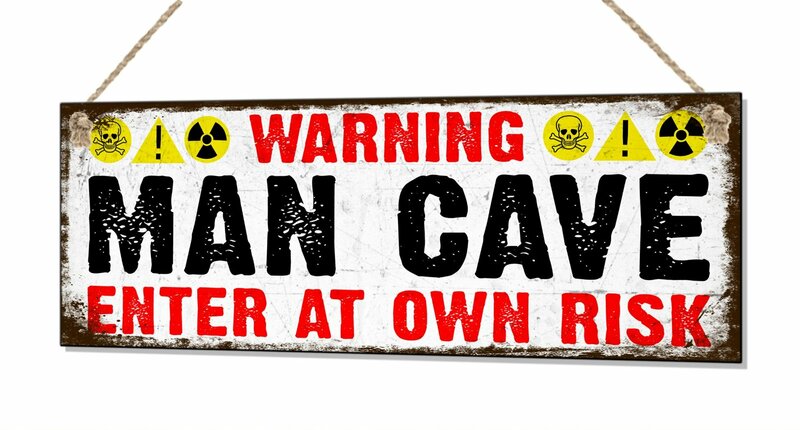 The Man Cave is an American term for sure, but you know what, it is also a pretty good one. 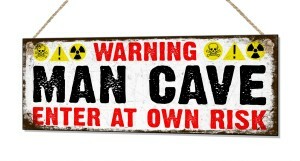 I like the name anyway and at the end of the day, shed man or man cave, gives out the same message. I found another sign at Amazon for under £5, so half the price of the one above. Made from plywood this one is well made and comes with the small rope to hang it. All you need to do is whack a nail into the wall and you have established your thoughts and your statement. 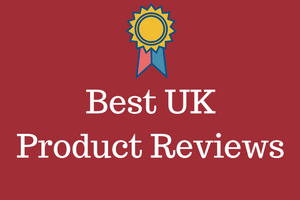 It is made in the UK and measures 90 mm by 180 mm, and for old farts like me that is 7″ by 3.5″. I will be sticking with inches until they put me 6 feet and not 2 metres into the ground. If you like metal, and I do, then here is a little beauty. I like the aged look and particularly like the skulls and warning signs. If nothing else anyone who sees it may indeed think you are a bit of a “psycho,” and if that helps keep unwanted visitors away, then Happy Days, your mission has been accomplished. This one costs around £7 over at Amazon. Now I have all three in my shed with the first two being what I call my comforting friends. In these days when all smokers have been turned into lepers, in my sanctuary I can smoke until it comes out of my ears. In there no-one can tell me to put it out, tell me to go outside, or try to put me in a shelter with no sides that the wind blows through, and the rain soaks me from head to toe. I think I have around 7 ashtrays in my Man cave so please come in, feel free to have a cigarette and chill out. Now back to my tools, I love them, and yes as sad as that may sound, I like them to be in certain places. I have 3 wood saws that hang side by side, a drawer for all my drill bits, those little containers with different size screws and many other such things. They are all there because I want them to be like that. It means when I go to do something I know where they are. Yes I can find stuff quickly and easily. This wonderful sign for just under £10 says it all. 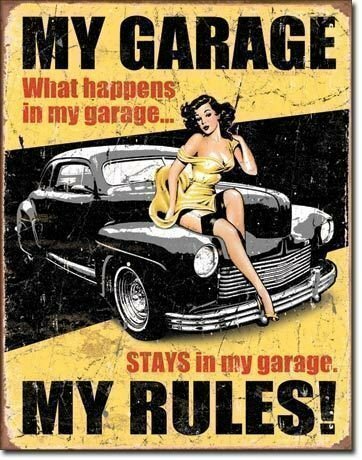 When I was having a shed rant the other evening over a beer someone asked me does it matter if you just have a garage rather than a shed? I told him it didn’t matter if it was an allotment, a shed, a garage or a workshop as long as it was a place of manly sanctuary. 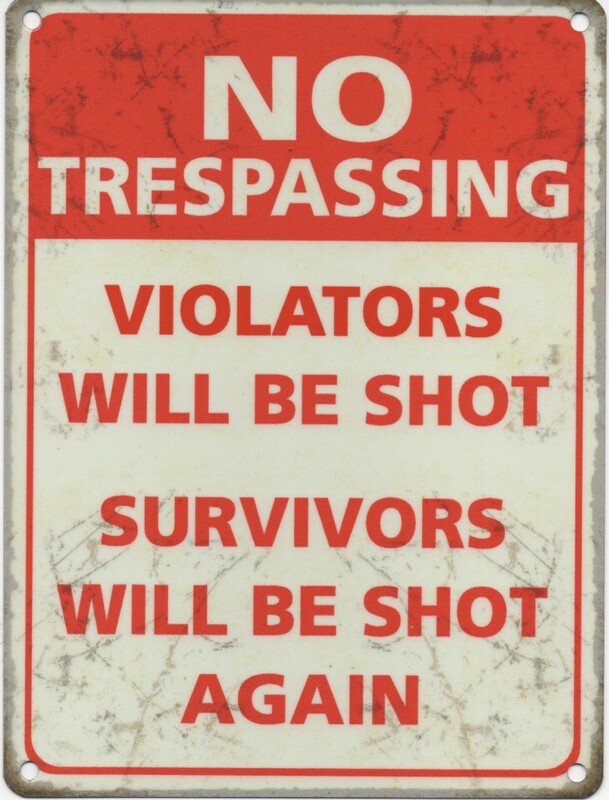 And finally if people don’t get the message that they have INVADED your inner sanctuary, then stick this on the door. 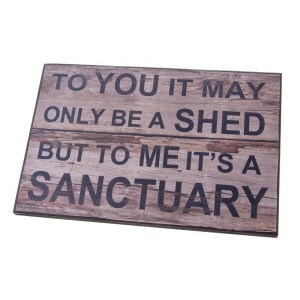 My friends if you own a shed, a garage, a workshop then simply get a sign. It speaks a thousand words to those who are not welcome in our inner sanctuaries.